by Atheeta Ching. Published on 8 September 2016. When discussing evolutionary arms races, it is common to think of predator-prey interactions. Over many generations, the predator tries to develop a better offence, and the prey a better defence. These selection pressures, however, can cause species to evolve some extreme traits. One drop of venom from the marbled cone sea snail is potent enough to kill over 20 humans, even though they don’t interact with species of our size. We see animals with such strong venom in nature because its prey (or predators) have a selection pressure for stronger resistance to this venom—leading to an arms race. Producing such strong venom is costly, but it clearly seems to have a net benefit for these species. How about interactions within a species? A good example here would be peacocks. Males have a selection pressure for longer and elaborate feathers used to attract mates, however this makes them more vulnerable to predation as it is easier to be seen and get caught. Again, in this case the benefits seem to outweigh the costs—but how can we analyse the maths behind arms races such as these? So all interactions involve 2 players and, for example, if an $S_1$ player meets an $S_2$ player, the $S_1$ would get a pay-off of $b$, whilst the $S_2$ gets $c$. In EGT these pay-offs are associated with fitness (in the evolutionary sense). The dynamics of the population can be analysed using the replicator equation to produce phase planes, however we’ll just focus on information we can directly get from the matrix. An important concept is finding an evolutionary stable strategy (ESS) – this is a strategy that, when played by the whole population, cannot be invaded by an alternate strategy that is initially rare. So an ESS is robust against invaders and the population will remain playing this strategy as time goes to infinity. i) $a>c$. This means any invaders ($S_2$) will have a lower average fitness than the current population as everyone will be mostly playing against $S_1$, so $S_1$ remains dominant after a few generations. ii) $a=c$ and $b>d$. In this case, when playing against $S_1$ , everyone gets the same pay-off. So additionally we would want $S_1$ to perform better against $S_2$ than $S_2$ does with itself, for $S_1$ to remain the dominant strategy. The conditions for when $S_2$ is an ESS are found using the same reasoning [ i) $d>b$, ii) $d=b$ and $c>a$]. From our conditions above, we find that the large strategy is an ESS and the small strategy is not an ESS. What does this mean for our beetles? 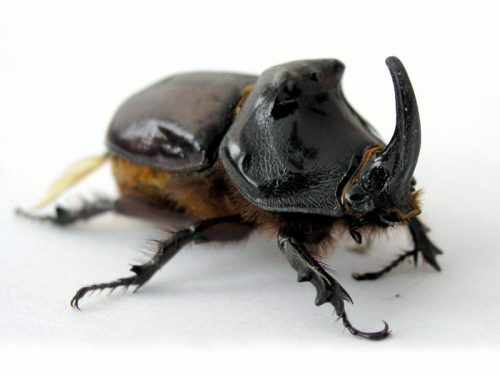 If we have a population of small beetles and introduce a large one (either by mutation or migration), then this large beetle will outcompete the rest of the population and pass on more genes. As the generations go on, this population will all end up being large. Since the large strategy is an ESS, it cannot be invaded by small beetles, so the whole population will remain large. This actually has an interesting consequence. When the population was all small, everyone had a fitness of 5. On the other hand when the whole population becomes large, everyone has a lower fitness of 3, even though this was selected for by evolution. This does not go against Darwin’s survival of the fittest as the introduction of large beetles is a change in the environment and they outcompete the smaller ones. In fact you can check that in any mixed population, the large beetles have a greater average fitness than the small beetles. Note that generally in 2 strategy games, it is possible to have other outcomes such as a mixed population being stable instead of a homogeneous population as above. Of course, there is a balance to all of this; beetles that are too large to sustain themselves would be selected against in evolution. Variable environmental factors can also affect the optimal size of these beetles. Insects respire via diffusion, which is more inefficient the larger you are – or more accurately, the smaller your surface area to volume ratio is. This is believed to be the main limiting factor for insect size. Back in the prehistoric days, insects were gigantic compared to the ones we see today – the levels of oxygen in the air were also much higher allowing them to still respire effectively despite their size. With these factors in mind, it seems like I don’t we don’t need to worry about insects getting larger! 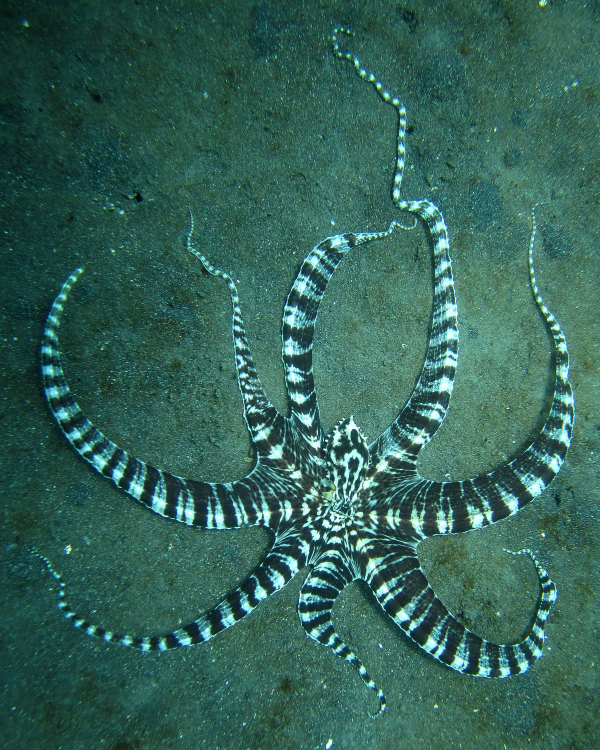 A mimic octopus can resemble venomous lionfish, sea snakes and more! In nature, there are also strategies to avoid these arms races between predators and prey. Poisonous or venomous prey tend to have bright coloured markings to indicate their toxicity to possible predators. However, there are also examples of non-toxic animals which mimic the colouring of these prey if they share a common predator. This gives them the benefit of deterring the predators, whilst not having the cost of producing the toxins. This is referred to as Batesian mimicry and can also take the form of producing the same sounds, odours or even behaviours. Whilst this sounds like the best strategy, it is only effective when the mimics are much fewer in number than the ‘model’ prey, otherwise the predator wouldn’t associate these markings with danger (or in some cases, just foul taste! ).